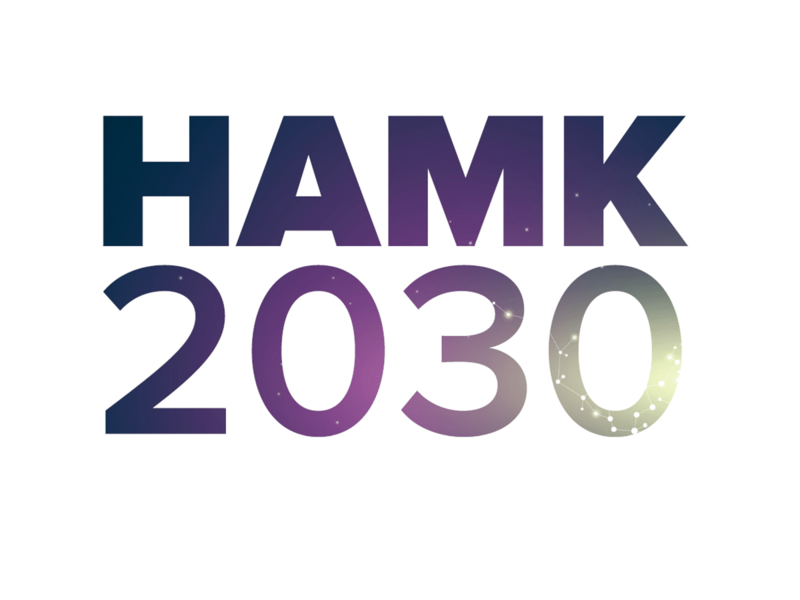 HAMK is a university of applied research, which offers competences and talents to renew the world of work. As a bold and creative reformer, HAMK has impact and achieves results. HAMK plays an important role in today’s society and leads development in its region. HAMK is an internationally and nationally networked higher education institution that is committed to its partnerships. HAMK graduates are desired experts in the labour market; they are global problem-solvers with a creative and progressive approach. Our applied research generates vitality, sustainability and wellbeing. HAMK effectively utilises the possibilities offered by technology in improving the quality and performance of education and research. The systematic development of expertise enables the setting of new, increasingly challenging strategic objectives. Our advanced operating methods ensure the up-to-date and excellent quality of our expertise. Our goal is to continuously increase the future-oriented intellectual capital of HAMK. We encourage our students to cultivate creativity and critical thinking in a complex operating environment. HAMK students are owners of their own learning, and teachers act as instructors and enablers of learning. Education at HAMK is based on three study models: 8–16, 18–100 and 24/7. Learning takes place in phenomenon-based modules that bring together different skills and competences. Of these, the student, and the customer, build a suitable entity in degree education, in the open university of applied sciences, and in made-to-order and continuing education. The benefits of digitalisation are utilised in teaching and guidance. At HAMK, students have an excellent learning experience. Businesses, the public sector and the third sector are strong partners in the planning and implementation of the modules. Work-based projects in the modules are an essential link between the workplace and our students and teachers. HAMK utilises a diverse range of appropriate pedagogical solutions, which are implemented with a strong international approach. HAMK generates and supports knowledge-intensive business activities. Entrepreneurship is a genuine option for each student. HAMK Global Education is an esteemed brand. The commercialization of education services is increasing especially in the degree programmes with tuition fees, which strengthens the position of HAMK as a higher education institution. HAMK is a SAFEA‑approved higher education institution in China. The applied research at HAMK produces new and creative solutions to increase the vitality, wellbeing and sustainability of businesses and our society. The role of businesses in research activities increases considerably. Together with stakeholders, profiled research programmes are established in order to increase relevant research work. A career as a researcher at HAMK is an internationally attractive alternative. The principal research scientists lead genuinely multidisciplinary research teams that contribute to the intellectual capital of HAMK. The research units are HAMK Bio, HAMK Edu, HAMK Smart and HAMK Tech. Research carried out at HAMK requires a high level of competence in the HAMK’s areas of expertise. HAMK research activities have an active role in solving challenges of sustainable growth in global networks. The HAMK research units operate in major international innovation ecosystems and acquire research funding from businesses and international sources. HAMK students have possibilities to carry out applied research. The HAMK alumni form an extensive network of cooperation and act as contacts in the labour market for applied research. We are a higher education institution with regional competence profiles. The students, alumni and stakeholders are closely connected to us. Our goals steer us towards multi-professional and multidisciplinary operations and working together. We value competence and we take care of the wellbeing of our higher education community. We continuously subject our work, outcomes and competences to internal as well as external, independent evaluation. The growth of HAMK consists of HAMK’s global education services, research activities and made-to-order education. Our facilities are in efficient and appropriate use. Our strong economy allows for investments in development. The future of HAMK is based on a high level of expertise, entrepreneurial and profitable activities, and controlled growth. 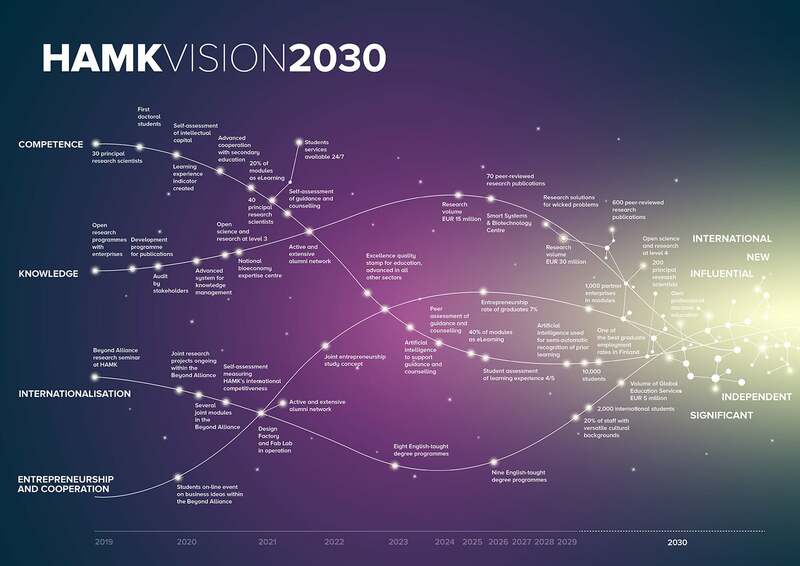 Together with HAMK 2030 strategy, a vision was published. See the image below how competence, knowledge, internationalisation, entrepreneurship and cooperation are tight together, creating a new, significant and influential university of applied sciences.